On Wednesday, March 25, representatives of Beebe Healthcare and CAMP Rehoboth were presented with a Governor’s Office proclamation recognizing March 23-27 as LGBTQ Health Equality Week. Gov. Jack Markell said the proclamation recognizes the need for health awareness in the LGBTQ (Lesbian-Gay-Bisexual-Transgender-Questioning) communities. “LGBTQ Health Equality Week is a time for all Americans to celebrate the progress and sacrifice of those who have walked before us, took a stance against prejudice to build lives of dignity and opportunity, advanced the cause of civil rights, and strengthened families and communities,” reads the proclamation. Gov. Markell said Health Equality Week should promote healthy living with equal medical care for all, and celebrate the diversity which makes up our great state. Gov. 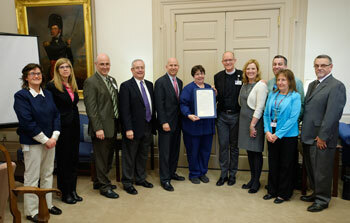 Jack Markell presented the LGBTQ Health Equality proclamation to members of Beebe Healthcare and CAMP Rehoboth. Shown (left to right) are Deborah Gottschalk, Chief Policy Advisor for the Delaware Department of Health and Social Services; Karyl Rattay, MD, MS, Director of the Delaware Division of Public Health; Jeffrey Hawtof, MD, Beebe Healthcare Vice President of Medical Operations and Informatics; Steve Elkins, co-founder of CAMP Rehoboth; Gov. Markell; Cheri Will, RN, Beebe Healthcare Sexual Assault Nurse Examiner (SANE) and Domestic Violence Coordinator; Rev. Tim Rodden, Director of Pastoral Services, Christiana Care Health System; Rita Landgraf, Secretary of the Delaware Department of Health and Social Services; Steven Rhone, RN, BSN, MS, NE-BC, Beebe Healthcare Vice President of Patient Care Services; Kelly Griffin, Beebe Healthcare Director of Marketing and Communications; and Dave Mangler, Director, Division of Professional Regulation. CAMP Rehoboth centered a week’s worth of events around LGBTQ Health Equality Week, including a health fair for which they partnered with Beebe Healthcare. 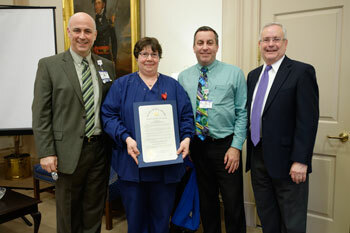 Shown (left to right) are Jeffrey Hawtof, MD, Beebe Healthcare Vice President of Medical Operations and Informatics; Cheri Will, RN, Beebe Healthcare Sexual Assault Nurse Examiner (SANE) and Domestic Violence Coordinator; Steven Rhone, RN, BSN, MS, NE-BC, Beebe Healthcare Vice President of Patient Care Services; and Steve Elkins, co-founder of CAMP Rehoboth.